Adam Toren has been an entrepreneur since he was seven years old. In high school, he and his brother, Matthew, used to import stereos and magic kits from Hong Kong to sell back home in Vancouver. They soon began buying struggling businesses, like pool halls and printing companies, and then rejuvenating them. They’re still helping businesses today through BizWarriors.com, but they’ve also started helping young people follow in their entrepreneurial footsteps. 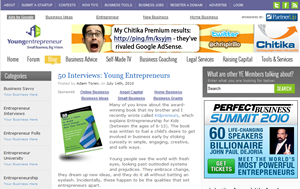 In 1999, Adam and Matthew launched YoungEntrepreneur.com, which has become the largest website in the world dedicated to empowering and educating aspiring entrepreneurs. They’ve also written a book on the subject, entitled, Kidpreneurs – Young Entrepreneurs with BIG Ideas. Today, Adam makes his home in Phoenix, Arizona. He’s 35 – and we’re including him here to provide a glimpse into the life, insight, and experience of an entrepreneur who has seen it all, but who’s still young at heart. The following is a short excerpt from 50 Interviews: Young Entrepreneurs (Volume 1). Get a free chapter at the bottom. Q: What drove you above and beyond, to entrepreneurship? A: My brother and I discovered entrepreneurship at early ages, before either of us were nine years old. We realized quite quickly that an entrepreneur is a visionary, a risk-taker, and a builder of businesses. We grew up learning the entrepreneurial lifestyle from our grandfather, Joe, who had been an entrepreneur all his life. He actually set us up on our first entrepreneurial venture selling these little stunt airplanes called Dipper-Do’s at a local folk festival. He taught us the proper way to use the stunt plane to really wow the audience and we sold out of them before the folk festival was over. What a great feeling for a couple of kids seven and eight years old! So it began: the entrepreneurial bug had bitten us. We then went from mini-venture to mini-venture throughout our schooling years. From importing stereo equipment and magic kits from Hong Kong, we learned a lot and made some money along the way. Then, as soon as we graduated from high school, we took the money we had earned and bought a struggling billiard hall in an up-and-coming part of our town. This is where we learned the saying that you hear so often from entrepreneurs: “We poured our blood, sweat, and tears into that business.” We built the billiard hall into quite the happening spot, with a stage for live jazz, a liquor license, and a small café within the location. We ended up getting a great offer to sell in our 12th month of being in business. Some things have definitely stayed the same since our first business venture: our dedication, work ethic, determination, and our passion to help others start, manage, and grow successful business ventures. A: My brother and I have some exciting plans in the works. We are working on creating a fund for young entrepreneurs, which will allow us to invest smaller amounts of capital ($5,000-$25,000) to assist in launching solid business ideas, while also providing the mentorship and support that all of us entrepreneurs need during our journey. We’ve done a lot and plan to do a lot more. I think that my 18-year-old self would be very impressed with what my brother and I have accomplished so far in this chapter of our entrepreneurial life. Stay tuned for much more, though! A: Thanks for inviting me to participate in such a great interview and what looks to be a superb collection of interviews. I’m looking forward to reading the book and spreading the word! This is an abridged version from Adam’s BONUS interview in our latest project, 50 Interviews: Young Entrepreneurs. 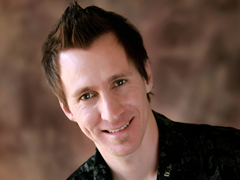 Adam is a seasoned entrepreneur who can spot opportunities from 882 miles away. He gave me a call after receiving our promotional copy in the mail and I was thrilled to have the opportunity to pick his brain. Keep a close eye on what he’s doing at YoungEntrepreneur.com. Ooh, a free chapter?! Enter your email below and discover Adora’s secrets in a matter of minutes. Our mission is to collect the best entrepreneurial advice from the top young entrepreneurs and give it to aspiring young entrepreneurs around the world. The first volume of 50 Interviews Young Entrepreneurs: What it Takes to Make More Money than Your Parents is doing just that. Nick and Nick has written 29 article(s) for JuniorBiz.com.